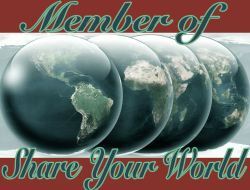 Once again, it’s time for Cee’s Share Your World. This is the chance for us to share a little about ourselves. Now isn’t that exciting? Hey, we all want to get to know our fellow bloggers. That way they aren’t just words on your computer, iPhone, iPad or whatever other device you use. We become a bit more human and little less bot. It’s all good. Cee usually asks us 4 questions that we are to answer. This time we got us a bonus question too. Now, let’s get on with it, shall we? Could I not have both? I mean I would just be dreaming anyway, as I can’t afford to have them, nor do I have room for them. So, since I am dreaming, I want them both. A nice quiet, comfortable reading nook. A place that has a soft place to sit or lounge. Bright and cheerful yet lets you have a piece of solitude. Then I would like a separate room that is well lit, airy and spacious for an art room. Someplace I can leave my easel standing, my paints laid out, brushes at the ready. A room with lots of natural light, maybe a wall of windows, or a skylight. Well, why not both? It is my dream after all. I would also want a place in the corner for my iPod stand. I have one of those that you set your iPod in and it charges it, but also lets you play it. I like to blast music as I paint. That’s not too much to ask for is it? The TV could stay in the living room. That’s fine with me. The only place I don’t like a TV is in the bedroom. I need quiet to sleep, I don’t need a TV keeping me up at night. I can certainly think of other more enjoyable ways to keep me awake at night other than the TV. My bedroom right now is a boring dark beige sort of color. I didn’t choose it, it was that color when I moved in here. For a bedroom, white is always a good choice. Or I like soothing colors, light green, blue, I’ve even had at one time a pale lavender. It works. Nothing bright, as it should be a place of softness and comfort. At least in my opinion. Depends really. I’ve lived in both. As I get older, though, a one level might be easier on me. But having the bedrooms upstairs, where nosy people can’t readily look in there works too. Ha-ha! I like my privacy. I used to know a man who loved going through the other friends’ bedrooms. He said you really got to know your friends by their bedrooms, how neat they kept them, what they had in them, etc. I asked him once if he went through peoples drawers and stuff. He said if given a chance he did. Needless to say, he didn’t stay a friend for long. That for me crosses the line into creepy! I’m grateful for friends, for being able to be there for them, even if it’s in a small way. I’m grateful that it became one more week closer to spring! Bring it on! I’m looking forward to warmer weather in the coming week that has been promised to us from the weather guys. So what are YOU grateful for this week? “More human and less bot”–I like that sentiment! You are right tiny, it’s age pure and simple. hahaha! I do prefer one level homes though. Much easier. Great post Jackie. I’m not one for a lot of stairs so my one level house is good for me. I agree about bedrooms they look good in white and mine has a blue feature wall which works well for me, I think everyone would like a space to read and do our art, but like you space is not always available, I do have TV in the bedroom but it is a convenience TV. This week I am grateful to life for being so good to me. wonderful comment Michael, thank you. Blue is very calming, especially in the bedroom. Sad isn’t it when we don’t have the space for all our dream rooms. One has to just adapt. I miss a dog so much but this is not the place for one. Still looking for a house so I can. A reading nook and an art studio, huh? Well, like you say, it is your dream house! sometimes I get greedy. And as it’s only a dream why not right? Thanks for reading! Your art studio sounds wonderful. I’ll have one of those, too! 😉 You had a male friend who would sneak into bedrooms and peek in drawers? Yuck! But great answers, Jackie! Yeah, he was a bit weird. Thanks Maddie!